Known as the eBay “Haunted Painting,” The Hands Resist Him has been regarded as one of the most haunted paintings in the world. 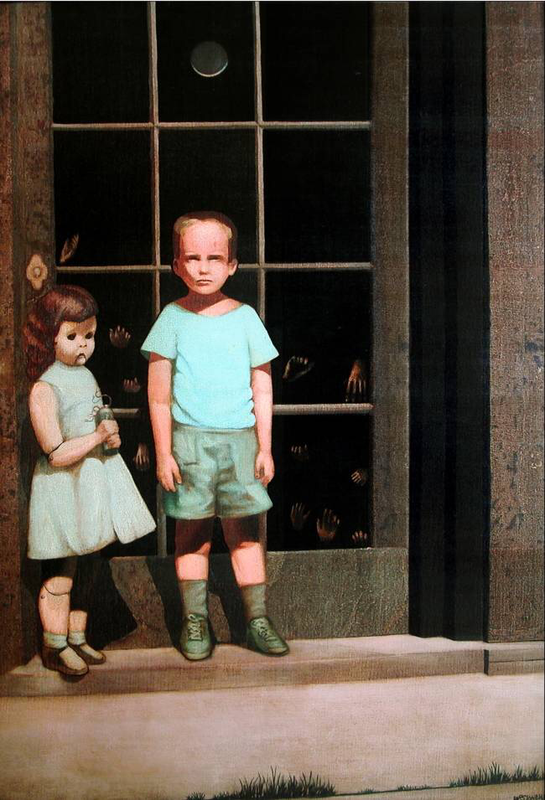 Created by artist Bill Stoneham in 1972 it depicts a young boy with what looks like a creepy life-size doll, standing beside him in front of a glass-panelled door. Behind the door, is a dark room with floating hands pressed on the glass. “The hands were all of the possibilities….You were left with the question, ‘Are these disembodied hands? Are they dismembered, floating there in space? Or are they connected to bodies?”. Once released onto the internet, it rapidly gained interest with over 30,000 views. People suddenly started to report strange occurrences when seeing the painting online. Some people said they felt nauseous, faint, dizzy, or irrationally terrified when looking at the image. Others claimed that their children would run away screaming when they saw it or that infants would cry in its presence. Reports of eerie disembodied voices or feeling hot gusts of air when looking at the painting, blanking out for long periods of time, being gripped by some unseen force, being grabbed or tickled by invisible hands, or even having their mind controlled by a mysterious entity. Over 60 paintings were produced by Italian painter Bruno Amadio, also known as Giovanni Bragolin. 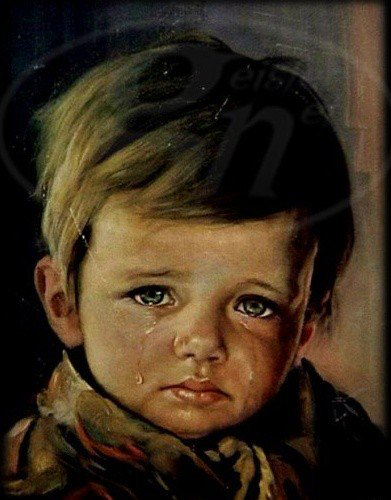 During the 1950s his ‘Crying Boy’ series (depicting young crying orphans of unknown origins) were sold as souvenirs to the general public and gained popularity as a series of prints in England. It was not until 1985 that this painting’s reputation took a spooky turn. A story run by a British newspaper ‘The Sun’ reported that a Chelmsford firefighter claimed that a high number of these prints had been found in the ashes and rubble of over 50 burned down houses, always lying face down on the floor and always undamaged. Organising a mass bonfire The Sun asked its readers to send them their cursed copies and spectators reported the paintings did indeed burn remarkably slowly. Following an investigation it was concluded that the paintings could be coated with fire-repellent varnish (for reasons unknown) and that they are found face down due to the burning of the string holding the frame to the wall. Numerous psychics would go on to make claims that the portraits were haunted by the ghosts of the many orphans who had died during World War II, and the whole story almost took on the air of an urban legend. From the artist most famous for his painting ‘The Scream’, you would think that Edvard Munch’s famous dark and moody work would have numerous spooky stories around it. 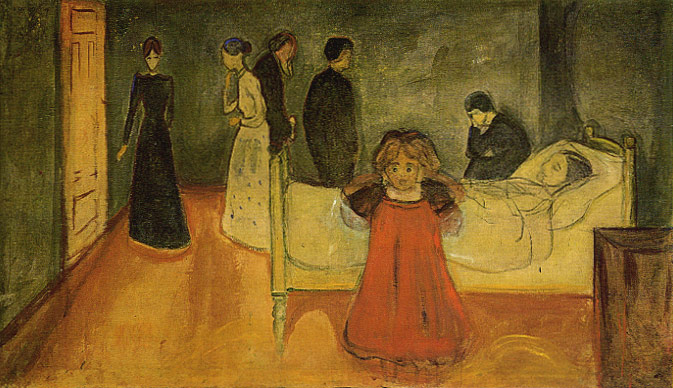 But it is another one of his paintings that is said to be haunted, ‘The Dead Mother,’that was inspired by the death of his own mother from tuberculosis when he was just 5-years-old. People who have owned the painting claimed that the girl’s eyes incessantly followed them, that the sheets on mother’s bed in the painting would rustle or move, or even that the girl’s apparition would occasionally leave the painting altogether. 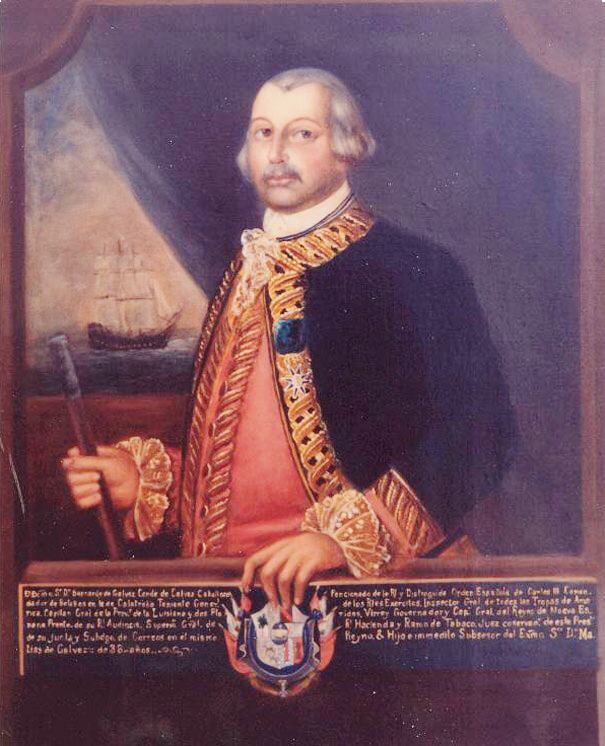 Hanging at the end of a downstairs hallway in the Hotel Gálvez, Texas, you can find the portrait of Spanish military leader Bernardo De Galvez who aided American forces during the Revolutionary War, and for whom the town of Galveston is named after. Visitors and employees have claimed that the eyes of the portrait would follow them as they past by. Orbs and cold spots have been reported near the painting and most bizarrely it is said that if you do not explicitly ask for permission from Bernardo de Galvez’s spirit to take pictures of his portrait, the resulting photos would either be blurry or distorted. To test this claim, during a paranormal team’s investigation at the hotel, one of the photos taken without permission did produce a ghostly skeleton figure near the work. Found in the picture gallery of the Royal Holloway College at the University of London, ‘Man Proposes, God Disposes’ painted by Sir Edwin Landseer shows the crew of the doomed Arctic expedition of 1845 led by Sir John Franklin being devoured by ferocious polar bears. It is said to drive students mad or to make them fail their exams, which is a bit problematic considering the picture gallery is often used for taking exams. So persistent were the rumours that it is customary for the university to cover the painting with a Union Jack flag in the days leading up to, as well as during, an exam. One story told at the university is that of a student becoming so hopelessly upset by the painting that she was driven insane and killed herself at her desk in front of everyone. 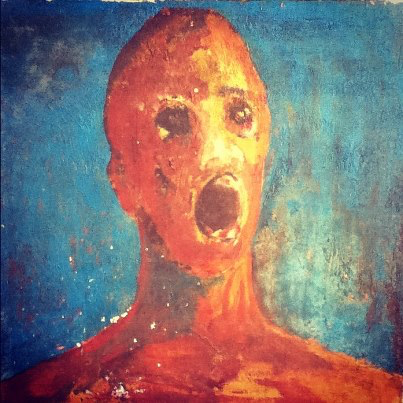 The original artist of The Anguished Man was said to have used his own blood as part of the pigment used in the painting and soon after its completion took his own life. The painting, now owned by Sean Robinson, first belonged to his grandmother who had told him stories of how she would hear screaming and crying coming from the attic where she kept the painting for 25 years. 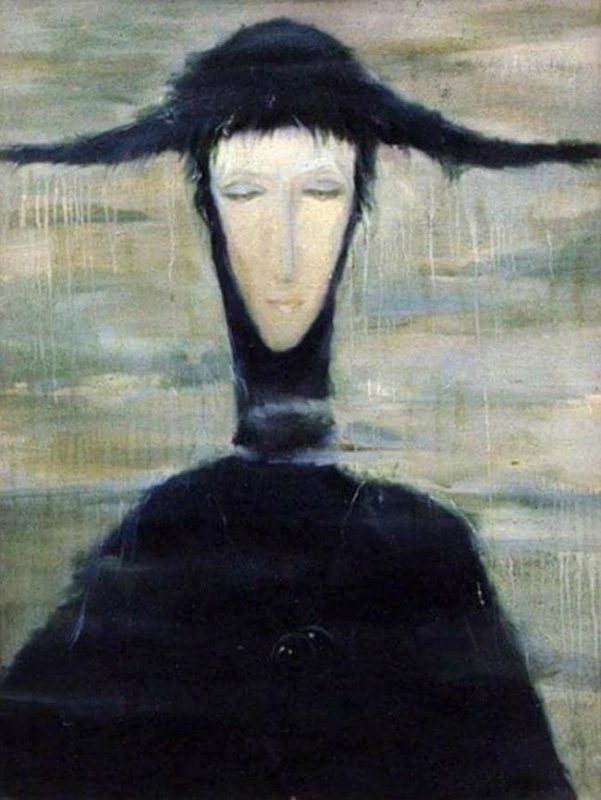 At one point, she claimed to have seen a shadowy figure, which convinced her that it was haunted by the artist himself and was the main reason why she had placed it in the attic for all of those years. After his grandmother passed away in 2010, Sean took the painting home with him and immediately claimed to have similar experiences to that of his grandmother. His son was pushed down the stairs by unseen hands, his wife often felt something stroking her hair and there were numerous other instances of poltergeist activity around their house. Following these events Sean decided to set up a camera near the painting to record the paranormal phenomena and uploaded his findings to YouTube. The videos show various instances of alleged ghostly activity such as the painting falling to the floor, doors slamming shut, and even smoke rising up from the painting (though many viewers have claimed that it is nothing but a hoax). 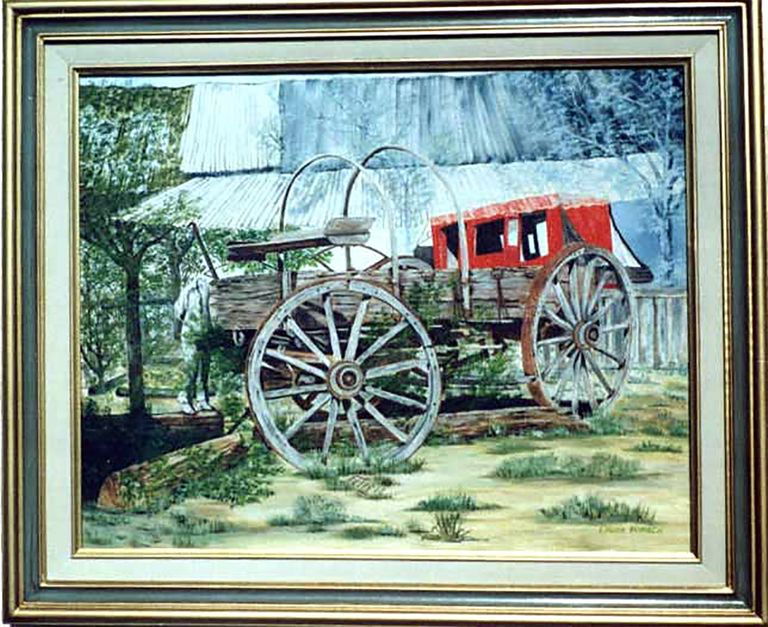 In the mid-1990s, the artist Laura P. was making a living from creating oil paintings based on photographs. One such photo she was working on was taken by commercial photographer James Kidd. A double exposure of a stagecoach stop, an old stagecoach, and an old wagon. The resulting photo was surprisingly eerie when a headless man appeared standing on a log at the left side of the wagon. Kidd asked experts at Kodak to examine his photo to prove that it was not altered in any way, which they did. Laura reported that almost upon starting the painting she was overcome with a palpable sense of dread, fear, and unease but eventually, was able to finish the it. Laura hung the finished painting at a local office where nearly immediately strange occurrences started happening. Each morning the painting was crooked, even though it had been straightened the previous day, objects would be moved to different locations and papers would go missing. Blaming the painting Laura’s colleagues asked her to take it down, which she did and moved it to her own home, but this relocation did not stop the strangeness. Once home various anomalous sounds such as knocks, bangs, footsteps, and other less definable noises were reported. Objects would move on their own, spilt salt would be found next to an upright salt shaker, doors opening by themselves, a garage roof would leak even though it was checked multiple times and the dogs would suddenly growling or be spooked for no discernible reason. It was not just Laura and her family that would experience the paintings weird going-ons, friends would also fall foul to its unexplained behaviour. One laughed at it and that night upon returning home, a large clock that had been hanging on the wall for nearly 40 years suddenly fell and was smashed to pieces. Another photographed the painting to show his mother-in-law, and when he placed them on a table at home, he claimed to have seen a spectral, headless figure looming in the shadows from the corner of his eye, prompting him to immediately dispose of the pictures he had taken and he told Laura he would never touch the picture again. 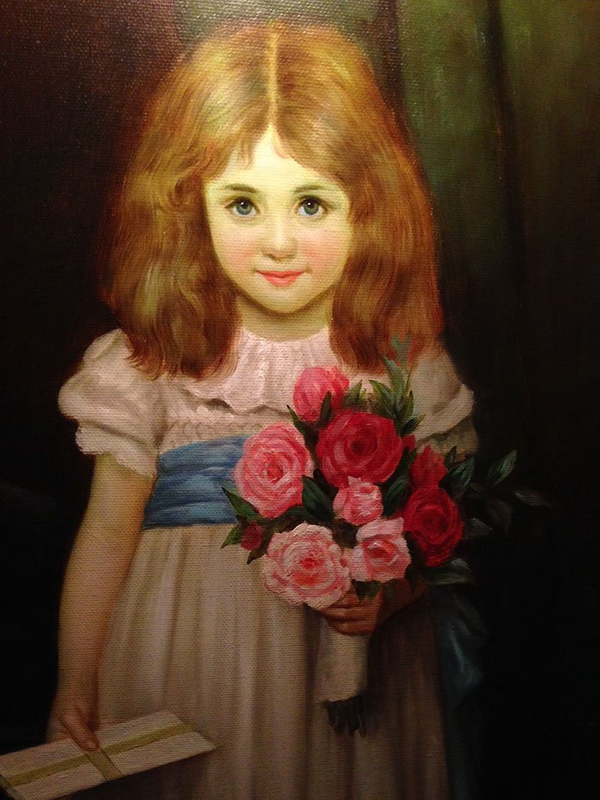 Hanging in the Driskill Hotel in Austin, Texas, this painting is thought to depict 4-year-old Samantha Houston, the daughter of a US senator who fell to her death in 1887 while staying at the hotel. Today many guests and employees claim that merely gazing upon the painting can make you feel ill, dizzy, or nauseous. Some have reported seeing Samantha’s ghost in the hotels hall (playing with a ball) while others have said that the girls expression changes or she slightly shift positions if viewed for to long. Finished in just 5 hours, Ukrainian artist Svetlana Telets claimed that as she was working on this piece, she felt as though someone else seem to be drawing with her hand or that some unknown power was forcing her paint it. Even before she came came up with the idea to create the painting she claimed that she felt as though she was being watched for a period of six months. All buyers of the painting returned it with complaints of insomnia, anxiety, and the feelings of being watched.